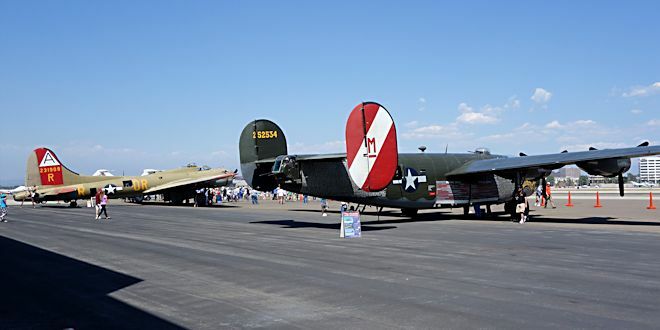 The Collings Foundation “Wings of Freedom Tour” will be making it’s annual stop at the Lyon Air Museum at John Wayne Airport on May 7-11, 2014 with their Boeing B-17G Flying Fortress “Nine-0-Nine”, their Consolidated B-24J Liberator “Witchcraft”, and their North American P-51C Mustang “Betty Jane”. The Lyon Air Museum is a truly remarkable destination in it’s own right, but the visit by the Collings Foundation aircraft provides a unique opportunity to see their historic aircraft up-close and personal and actually go inside the bombers and see them from the perspective of the crews who flew missions in them during World War II. To quote the TV pitchman Ron Popeil: “But wait, there’s more! 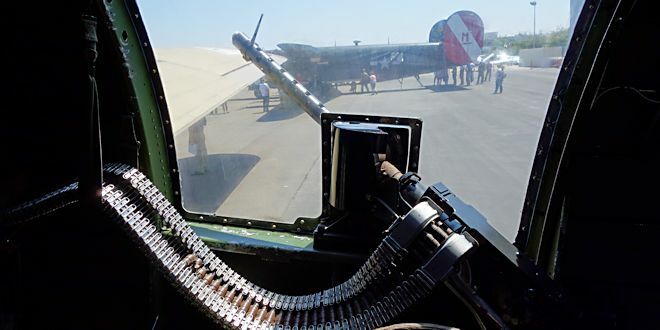 :” The Collings Foundation even offers 30 minute flights in the bombers ($450 per person) and 30 minute ($2200) or 60 minute ($3200) flights in the Mustang. I’ll add that the P-51C is the world’s only dual-control Mustang and flights include “hands-on” instruction by a certified instructor. The majority of the cost for these flights is a tax-deductible donation to a 501c3 educational non-profit. 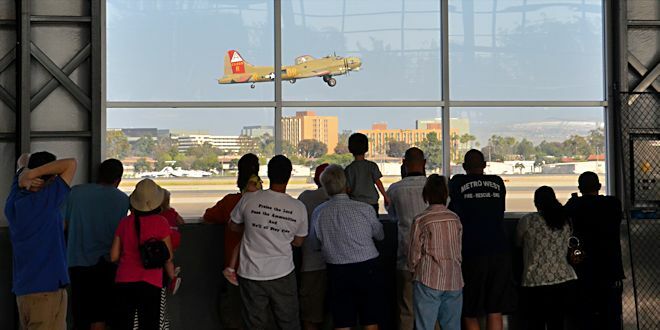 A typical day at the museum during the Collings Foundation visit goes something like this: The aircraft will fly in the morning and late afternoon and visitors will be required to stay inside the museum during flight operations. Mid-day the planes will be on static display and visitors will be allowed out on the tarmac where they can wander around and through the visiting aircraft. The actual hours of flight operations can vary from day-to-day depending on the number of people who book flights. Please note that the visiting aircraft are only part of the wonderful things that you’ll find at the Lyon Air Museum. 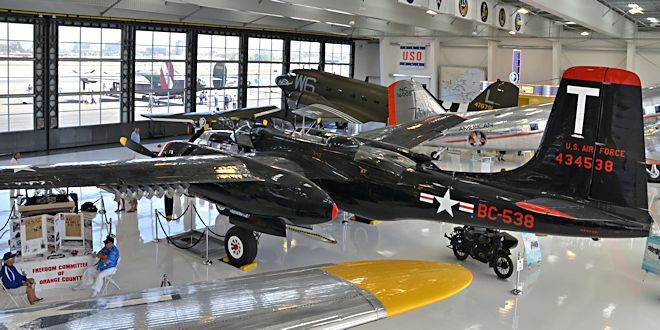 The museum has it’s own collection of restored aircraft which includes a Douglas DC-3, Douglas C-47 Dakota, North American B-25 Mitchell, Douglas A-26 Invader, and their own Boeing B-17 Flying Fortress. 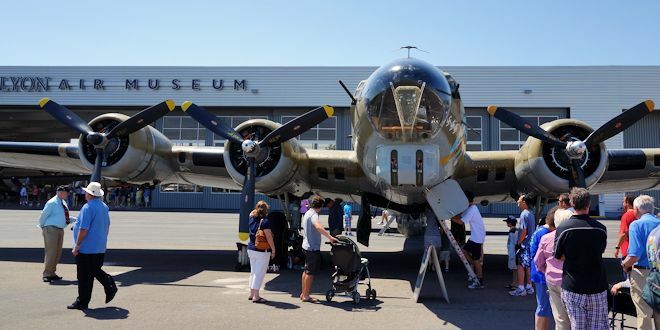 Also on display is a fascinating collection of World War II era automobiles, motorcycles, military vehicles, and other memorabilia along with a large contingent of museum docents who are eager to explain everything.